I'll be the first to admit that I have a bit of a soft spot for Arnold Schwarzenegger. As a teenager I saw nearly all his films (except Jingle All the Way – you have to draw the line somewhere), while Terminator 2 is one of my all time favourite movies. But entertaining as he is, I've never really thought that the Governator can actually act. Is Maggie, in which he plays the father of a dying daughter, his chance to prove me wrong? In this re-imagining of the undead apocalypse, however, things are far more tightly controlled than usual. No feral herds of walkers stalk the land here: instead the infected are corralled into quarantine zones and dispatched by lethal injection. Unless, of course, their father is best buds with the local doctor, and they're allowed to wait out 'the turn' in the comfort of their own home. Like last year's new twist on the seemingly immortal zombie genre, Life After Beth, Maggie has a horrible inevitability to it. There's only one way things are gonna end, surely? 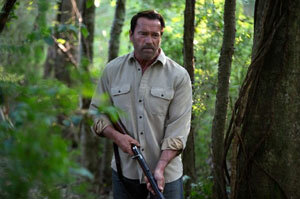 With Arnie doing what he does best: toting a great big gun. Surely? But while the premise of this sweet, sad movie may be rooted firmly in horror, its execution (if you'll pardon the pun) is more Nicholas Sparks than George A Romero. (Okay, not that bad.) Just as Harold's Going Stiff equated the onset of zombie-ism with the debilitating process of growing old, so Maggie's deadly virus is viewed as a kind of dementia. And once she is no longer herself, she must be put down. Like an information reel about the right to die, it raises awkward questions about choice and fear and dignity in death, framed through a moving story that isn't quite Hayley and Roy but isn't far off. And guess what? Arnie is really rather good: a large, lumbering, stoical figure, weighed down by worries he's incapable of vocalising, his love and anguish expressed through tired, wrinkled eyes, huge shoulders slumped in defeat. But fear not, he does get to knock off the odd zombie. He is Arnie, after all.